Living in Florida has its perks. There are plenty of rainy days that come with the territory, but there are also days like this: the opening weekend of the Florida scalloping season. People who aren’t from Florida assume that all we’ve got is palm trees and tan lines, but it turns out we’ve got brackish water and a knack for fishing and hunting, too. Here’s what you need to know to have an amazing Florida Scallop Season. Here's How to Have the Best Florida Scallop Season Yet! If you’ve ever been to Florida, you know that preparations NEED to be taken before you hit the water. Unpredictable is the best way to describe the weather here. Florida isn’t always as sunny as people who live elsewhere think, so be prepared for the possibility of rain. But also be prepared for the hottest damn day of your year! Umbrellas, towels, a change of clothes, tons of water to keep hydrated and ponchos are a few of a Floridian’s favorite things. Remember to stay hydrated throughout the entire day. It’s easy to get caught up snorkeling and forget to drink water, but it is SO important to drink as much water as you can! Like I said before - Florida isn’t all palm trees. Head to the top spots for scallops to find the best supply of scallops for your choosing. The video in this post was taken out in Homosassa which is one of the 4 spots to hit, the others are: Crystal River, Steinhatchee, and Keaton. I can speak for the other locations since I haven’t yet been, but Homosassa is a great place to start. There is a huge area to cover and the ride to the site is a pleasant one. My group docked out at the River Haven Marina. Arrive early and be courteous to the other scallopers. The staff at the marina are amazing and answer any questions you may have about where to go, so don’t be shy! Remember, there are no stupid questions. Florida Scallop Season begins on July 1 and ends September 24th. Although FWC has the right to open the season a bit early and extend it a little later, use this as a guideline and always keep up with the regulations. FWC patrols the water and if boarded, you’ll be prompted to show your Florida Saltwater License if you are 16 or older. Not sure where to get one? Walmart is an easy and accessible spot to go to pick one up. When it comes to the act of scalloping itself, you are allowed 10 gallons per boat (with shells) or 2 gallons per person. If you plan on cleaning the shells while on the water, the numbers are as followed: ½ gallons cleaned per boat or 1 pint cleaned per person. So a short and sweet essentials list is as followed: saltwater licenses, diver mask & snorkels, water shoes, swim fins, flares, flare gun, whistle, spoon/knife for cleaning, mesh bag, gallon buckets, scoop net, and a dive flag on a PVC pole. Don't forget these essentials because they are a must! Want to know what else we brought for a day of success and not a worry in the world? Sign up below. signing up so you don’t forget a thing! Thanks for signing up! Confirm your suscription and your freebie will be on the way to your inbox! Scalloping is prominent in Citrus and Hernando County. Throughout the season, be sure to arrive early to your chosen dock because traffic is to be expected. Speaking of crowds, stay apx. 300 feet from other boats with dive flags. Divers wander. It’s easy to stray away from your boat when you’re looking for fun under the sea! Be sure to keep your eyes peeled for divers, drive slow and be aware of your surroundings at all times. Scallops like the sandy areas filled with grass. Keep your eyes open for their shells and blue eyes in the weeds! These grassy areas can get tricky. Idle in 3-4 foot water because the grass could find it’s way to the intake easily and cause problems with your boat. It’s said that the sun brings these little guys to the top of the grass. Look for patches of light to find more! Sunny conditions will help your chance of reaching the limit. Scallops will try and clamp down on your fingers, so be alert! Grab them from the back if you can and put them right in your net. Speaking of critters, be aware of your surroundings at all times. My first time out on the water I saw dolphins, stingray, a seahorse, starfish, and multiple crabs! And let’s not forget about all the amazing fish and coral (be careful, that can hurt, too). Always let someone know you are going out to scallop whether it be a family member, friend, or the marina. Be aware of afternoon storms and don’t try and wait it out if the sky is getting dark. Once you’ve got your scallops, put them on ice as soon as possible. They die with the shells open and this makes them easier to clean! Be sure to keep your scallops chilled over ice all the way up until you’re cooking the little guys in your kitchen. Many people don’t know that after your catch, you have the option of reporting your harvest to researchers so they may continue to research the scallops. They track the health of the population and try and pinpoint where they are migrating to! Report your findings here or save the page for later! As always, I’d like to remind you to be kind to Mother Nature and all of her children. As I said early on, in just one day of scalloping, we saw starfish, crab, stingray, dolphin, seahorse, and tons of fish. The open water is home to so many beautiful creatures we have to be aware of at all times. On our ride out, we stopped twice to collect trash in the water. The first time it was a Fourth of July Balloon and the second it was a large piece of plastic (probably a boat bumper part) floating above the water. Turtles and other creatures don’t know that these things can cause harm. To play our part in keeping them safe, I encourage you to bring a bag for trash pick up and make sure to stop (if it is safe) and collect the items you see in the water that aren’t meant to be out in nature. 7 | Last, but Not Least: HAVE FUN! 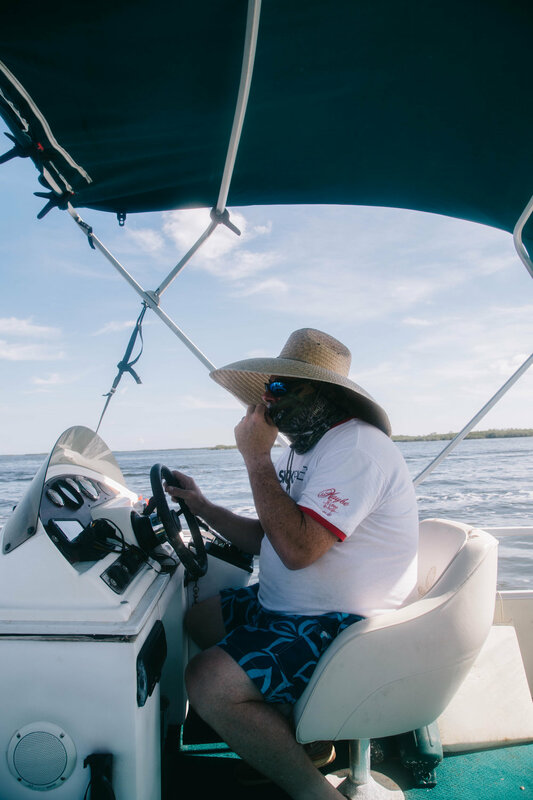 Although scalloping is an easy, relaxing task, we can’t all be like my Uncle Scott and his wife who catch more scallops than I thought was even possible. Remember to have fun out on the water no matter if you catch one little guy or 30! I want to give a big shout out to Scott and Julie for taking me out for my first time scalloping. If you’ve got friends/family as great as mine, you are guaranteed an amazing time out on the water, so plan your scalloping trip now! One of the best things about living in Florida is the ability to hit the water for a carefree day even when you’ve got work in the morning or even later on in the afternoon. Smile. Feel the breeze. Taste the salt on your skin. And most importantly... Enjoy the ride. #LiveTheDetour on Instagram to share all of your Florida Scallop Season travels with the More Detours Community! What are your tips for a great day on the water for this Florida Scallop Season?